Just like me, my girl loves egg tarts. She has been asking me to bake egg tarts for her quite some time back. With the house move, me falling ill twice during the last 3 months, her request was delayed. She has to resort to barter trade with me. Saying if she scores full marks for her 听写, will I bake her some? How can a mother deny such request right? To a homebaker like me, I am always on a quest to see how other's recipe fare. Even though I had found a reliable and well love recipe, I am still curious to attempt others. You never know, 一三比一三高. (oops did I use this phrase correctly?). 一山还有一山高 . Thanks to Mixue for correcting me. Now I learnt. Seeing many positive review on Molly's egg tart from one of the website, I decided to give it a shot. After all, one never cease to find a better recipe if given the opportunity right? Verdict: I will reduce the sugar alittle more. The crust is rather dry in handling, a tablespoon more milk or water will be good. The egg custard is good though but I didn't have enough egg mixture to fill in all my crust despite mom commented that my crust is too thick. Update: I was told that this is pretty similar to Hei Ma Ma's. Will attempt that one to make a comparison real soon. Overall, it is an easy recipe to attempt especially for beginner. Cream the butter and sugar till creamy. Add in the egg and mixed well. Lastly add in the flour and mix to form a soft dough. If the dough is sticky, you can add some more flour to mix till it is smooth and not sticky (add the flour a little at a time). Set aside while you mix the egg custard. Place water and sugar in a pot and boil till sugar is dissolved. Let it cool completely. Add milk into the sugar mixture and stir. Lightly beat the egg and add into the above. Mix well and strain the egg mixture. Pour into the prepared cup and bake at 160 Deg C for 20-25 mins or till the crust is slightly brown. Note : Prepare the egg custard first before you do the dough. The egg fillings recipe is exactly the same as Heimama recipe which is very famous among Chinese bloggers except fresh milk is used instead of evaporated milk. 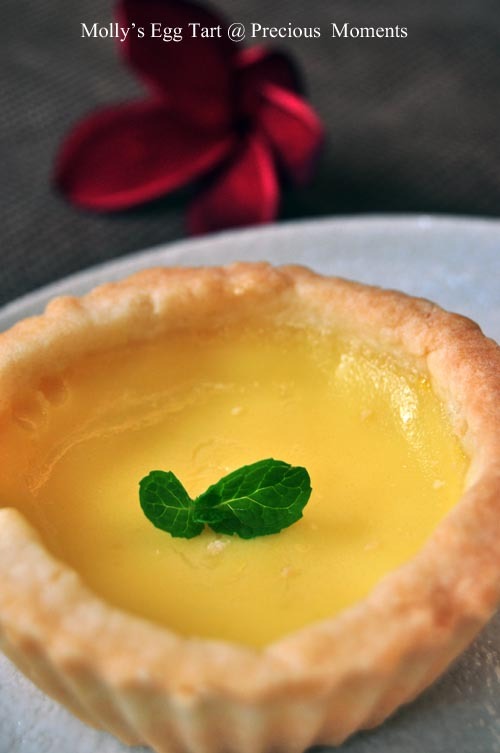 If you have not tried Heimama egg tarts I strongly recommend this recipe to you. I use rub-in method. Welcome to my blog Joceline. Angel, so this is not really the original. Pity my chinese proficiency in reading chinese blog is bare min. If not I am sure I will learn even more. I will def try hei mama coz my gal loves egg tart. Thanks 饱满人生. Yah parenting is really really tough these days. or perhaps i am poor at it. Thanks Mixue. See how 烂 my chinese. Hanushi, great to see you. Hope you are feeling better.